Described as a “sinister inter-dimensional bureaucrat”, G-man is a popular reoccurring character in the Half-Life series of video games. The dozens of outrageous Garry’s Mod images of G-man to be found online have propelled the character to meme status. I built this papercraft G-Man bust as a favor for a friend. 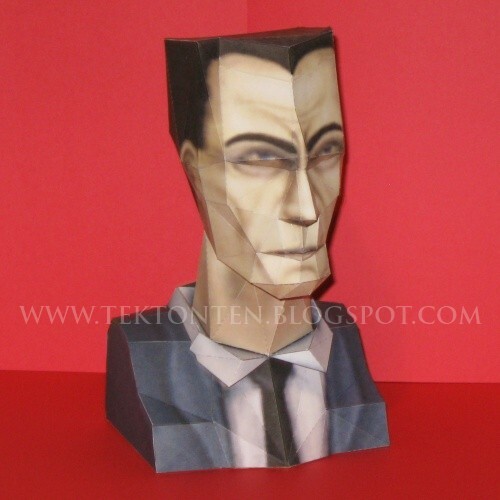 The bust is based on G-man's appearance in Half-Life 1. The finished model stands about 8” (20 cm) tall. Letter and A4 sized PDF templates (plus a Pepakura PDO file) may be downloaded here.